Sherrod Brown hasn't proven to have much appeal to Republicans or independents during his first four years in the Senate and as a result he could be vulnerable for reelection in 2012 if the GOP runs a strong candidate against him. Ohio voters are pretty evenly divided on whether Brown's done a good job in office so far- 40% approve of his performance while 37% disapprove. Democrats overwhelmingly like him, by a 66/9 spread. Republicans for the most part dislike him with only 16% approving to 62% who disapprove. The biggest problem for Brown though is independents- with them only 28% approve to 48% disapproving. To put those numbers into some perspective Ted Strickland, who was just defeated for reelection, is at a 38/42 spread with independents. Brown is tied in a hypothetical match up with Mike DeWine at 43% each. DeWine, having just been elected Attorney General, doesn't seem a likely candidate but the numbers give a good idea of how much the landscape has changed since Brown defeated DeWine by 12 points for reelection in 2006. DeWine wins over more Democrats (14%) than Brown does Republicans (8%) in that prospective match up and holds a 36-32 advantage with independents. Brown leads a trio of lesser known Republicans in hypothetical match ups but in none of those scenarios does his support rise above 43%. Against incoming Lieutenant Governor Mary Taylor he leads 40-38, against newly elected Secretary of State Jon Husted he's ahead 43-38, and against Congressman Jim Jordan the lead is 43-35. Those leads for Brown might be a little artificially high- with the exception of the Husted contest there are a lot more undecided Republicans than Democrats in each of those hypothetical match ups. That's likely a product of the GOP candidates' relative anonymity. 62% of voters don't know enough about Husted to have formed an opinion about him and that number rises to 65% for Taylor and 73% for Jordan. Those folks would probably pick up undecided Republicans as they became better known. Because Brown doesn't have a lot of crossover support it seems likely his fate will be closely intertwined with Barack Obama's. If Obama wins the state again, Brown likely will too. If Obama loses the state Brown's going to have a hard time, provided the GOP nominates a serviceable opponent against him- of course that's a big if as the party blew its chances against some easier marks than Brown in 2010 by nominating candidates far outside the mainstream. This is sad to hear because Brown has been a truly excellent Senator. What is wrong with "independents" in this country? So foolish. What is so "truly excellent" about him? Other than he votes against the Iraq War & Patriot Act, he has a despicable voting record that seems to benefit power-hungry politicians and crony capitalists. He voted to grant up to $700 billion to the banks, he voted to waste hundreds of billions on non-existent "shovel-ready" stimulus projects (Obama's words to the NYT, not mine), he voted to confirm Bernanke (who's never been accurate and desires inflationism which destroyed the contintental dollar, Weimer Republic's German marks, Zimbabwean dollars, etc. ), he voted to force people to purchase corporate health insurance (which'll certainly benefit the health insurance companies), and voted to increasing centralize more power into the hands of Washington bureaucrats and away from local citizens. I'm an independent who sees him as nothing more than a power-hungry career politicians who does nothing more than vote to give more money and power to bureaucrats and corporations. I also hope that Ohio removes in 2012 along with most everyone in Congress whether they're republican, democratic, or independent. I believe the number of "independents" has grown due to conservatives dissatisfaction with the GOP. For instance, many Tea Party people consider themselves independent. Nevertheless they will reliably vote for the candidate with an "R" by their name. This, of course, causes "independent" numbers to skew to the right. Brown's problem is that he's a far-leftist representing a center-right state. He even looks like a hippie liberal. "I believe the number of "independents" has grown due to conservatives dissatisfaction with the GOP. For instance, many Tea Party people consider themselves independent. Nevertheless they will reliably vote for the candidate with an "R" by their name. This, of course, causes "independent" numbers to skew to the right." 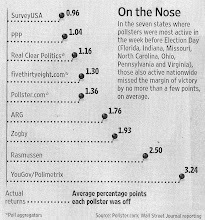 That was the case in 2010, but it's not proving to be the case in most places so far in our 2012 polls. Obama's doing pretty well with independents, and so are most of the Democratic Senate candidates. Brown's the only one who's got real trouble with them, and it's against essentially no-names (other than DeWine). All the potential challengers in Ohio are now no-name politicians except Mike DeWine. I would like see Steven Latourette and over all Pat Tiberi. But I must to wait for it. I'm not surprised by this numbers. Nothing rare here. The numbers for Sherrod Brown are just a little worse than the numbers for J Webb and a little better than the numbers for Claire McCaskill. Why not Coughlin....he's probably going to run. We can only make the poll so long. We tend to only test 3-5 candidates against one candidate from another party. As the race shapes up, there's plenty of time to test those who look most likely to run. Word on the street is that Dave Zanotti from the Ohio Round Table is entering the race as an independent. This should shake things up.